3. We want to reinforce our love of the sea, and the protection of the oceans with a giveaway of a Cocoa Tortuga- Sea Turtle Ocean Throw Pillow. Wabisabi Green donates a portion of every sale towards Sea Turtle Conservation with Pro Peninsula Community and Nature. 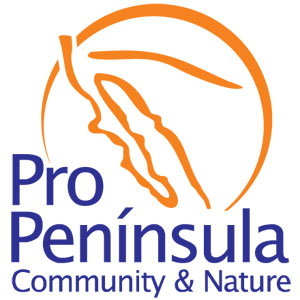 To learn more visit: propeninsula.org Pretty great way to support conservation efforts! Jolee lives in the tiny community of Encinitas, in southern California, a seaside town, where her appreciation of the ocean environment has continued to grow. 1. Become a new follower of the Everything Coastal Blog and/or leave us a comment about your eco-coastal lifestyle. **All entries (U.S. addresses only) must be received by midnight, Sunday July 31, 2011. Contest winner will be announced on the following Monday, August 1. 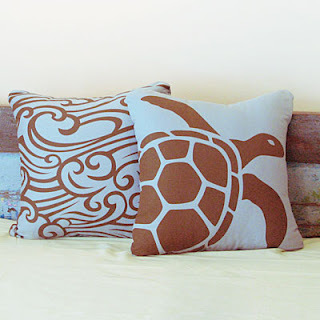 Here's a few of my favorite Wabisabi Green Eco-Friendly pillows on our site! 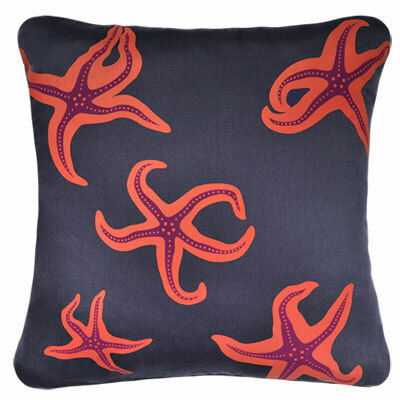 Purple, coral, slate starfish pillow! Thanks Jill! Michigan is sort of coastal... I took my kids to Lake Huron a long time ago, and was amazed at the color of the water. Incredible! I can only be eco-coastal in my mind, as there aren't many chances here in Missouri. But your site sure does help! I am so glad I found your page through Nicholas Landon Jewelry! I have had SO much fun browsing through everything! We live in Fort Lauderdale and try to spend every free moment on the beach. My husband was an Ocean Lifeguard - so over the years we have collected so many things from the beach - from sea glass, washed up sea fans, shells, sea beans - you name it. My entire home is decorated with as much "coastal" as I can get. Makes us feel like we are on perpetual vacation! Those pillows, I believe, would bring a little "vacation" feel to any home - coastal or not! Hi Wes! You truly live in a magical place - I LOVE Florida beaches, have carted home more than one suitcase full of shells. It's a little embarrassing! Beautiful pillows! I love living coastal here in Hawaii! Life is simple - and we appreciate the small things - sunsets on the sea, sharing with neighbors and friends, supporting local farmers, get-togethers on the beach. I am a follower of this blog and I love these pillows! I don't live on the coast, I am two hours away, but I'm an eco friendly here in the "city" by being a big recycler! I'm a new follower and live on the southwest coast of Florida. Our family really tries to live an ecofriendly life style. We eat no red meat and no endangered fish. Most of our diet consists of grains and vegetables. We have two fuel efficient cars,recycle,get almost of our mail electronically and live in a cottage that's adequate size-but not large by any means. I just love the pillows;they're gorgeous! The crab is my favorite, have seen it in magazine shots too!! I recycle..., eat no animals... (exception..., once in a while a grilled fish). And we traded our SUV into for a small Sedan -you won't believe how much money on gas we save too! We are serious trash collectors on our frequent trips to the beach! Even for short trips we always bring 2 leaf style trash bags. Before we have any fun- we fill those bags up. We often visit areas of the beach that are quite remote. Heavy equipment never reaches those areas and we do our part by picking up as much as we can. I love the blog and this fabulous giveaway. The pillows are super awesome! I like you on facebook (ChristineFidance) and I left a post. 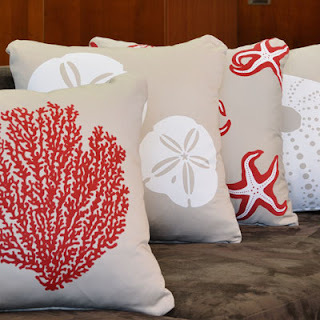 Liked Wabisabi Green on FB love these pillows! Think this is a great cause, I love the ocean but I do not live by it! Thanks! I'm land-locked here in Ohio, but I'm a beach girl at heart! These pillows are fabulous! ex new englander,so miss the ocean!! Those are some really nice pillows!!! Thanks so much for this post Caron, now following via Google reader! The pillows are my new favorite find :) I have my own blog and newly started online business for recycled handmade chic nautical products and environmental issues, www.artseachic.blogspot.com. That's just one of the ways I try to stay eco-friendly. Reusable grocery bag collecting, transforming wine bottles, old wood frames, etc into artsy creations, growing herbs, making sure to turn off lights, driving a fuel-efficient car, and volunteering for beach clean-ups are some of my favs! i follow your blog and I live at the Jersey Shore so I love this type of coastal decor. I liked Wasabi Green on facebook, great pillows! I can't believe I almost missed this, thank you for the reminder. 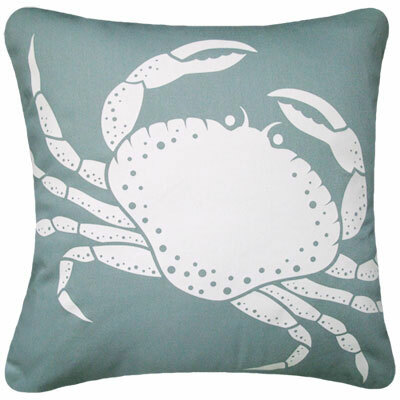 I love these pillows, especially the crab. :) I love living on Lake Michigan and finding ways to recycle things into my "cottage" home. Caon, thanks for the reminder. I am already a follower. I love the crab! I have so many crab things in my coastal home of SC it would fit perfect! So many natural elements in my home. I think my fave are my back splash tiles in my kitchen made from seashells. oops! Caron, and I can't type ! Thanks for including me and all those beachy pillows are gorgeous. Love that it helps an ocean wildlife org - sea turtles! I love coastal lifestyle because of everything it's about - relaxation, natural beauty, fun, and adventure! Beasically - all the things that your Shop is About! PS- Okay to post your giveaway on my blog? Seaside Style - typing mistakes are always forgiven! Liked Wasabi Greens FB page and left a comment! 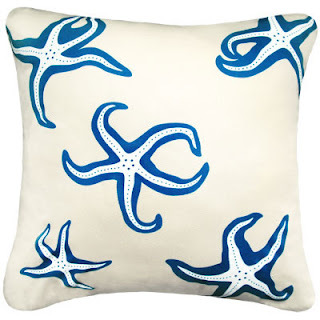 I am a subscriber also, but wanted to comment how much I love this blog and all its eco friendly beach inspired coastal products... Thos 2 Wasabi Green chocolate and aqua pillows are gorgeous, and I especially also love the linen color and white sea urchin and sand dollar pillows! Even when we may not purchase that day, the relationship we build with other coastal love people through these sites and blogs is priceless! So inspiring! The sea is such a gift! So glad I found you through Sally Lee and Simple Daisy! I love "everything" coastal...and this blog, too! LOVE the pillows!!! Being a coastal gal and a beachcomber, I gather the trash left behind by those unthinking sunbathers.It's interesting how the "dog" beach is cleaner than the "people" beach...I also plan my trips to the store to keep from making too many back and forth trips. And I LOVE painting on reclaimed wood...these "canvases" make the most interesting backgrounds for my paintings. I'm a new follower of Everything Coastal! Hi: Good giveaway. Like the lovely pillows. The ocean is my favorite place to relax and get away from it all. My life style along the coast is to take time for my self and a time to think about really nothing at all. Good blog. Follower Google Friends Connect. Just followed...nice blog! Live a very coastal life here in southeastern Mass.Nice pillows. We use to live in Hawaii, and it's sad when you are away from the tourist areas how much trash is on the beaches! When we would go, we would collect as much as we could and dispose it. Now we live in Virginia, so we miss the coastal lifestyle. Follow via GFC - Chip. What a great site. Has me wishing to go back to the ocean. Love these pillows! New Google Friend follower - thanks for the giveaway! Beautiful pillows. Love the crab and the coral ones. We are on the Emerald Coast and we pick up trash when we are on the boat. I'm a new follower and would love to win :D I grew up on the coast playing on the beach everyday, but now we live a few hours away so I miss it a lot. Still I think I incorporate eco coastal living with being a green in many different ways and also just living a mellow laid back life. I am a new follower! The pillows look awesome! Lovely pillows and how wonderful to support Sea Turtle Conservation! I lived aboard a sailing vessel exploring the ocean and taught ocean appreciation and conservation to many young students over the years. I would really enjoy a beautiful sea pillow to relax upon! gfc follower as gene smith. i live in wisconsin so lake michigan is as coastal as i get, though i do have an awesome coast themed bathroom. Caron, I found my way here through Completely Coastal - and am so glad I did. We live on the coast, my husband and son surf, and we are a huge beach loving family. Therefore, are doing our best to help conserve our coastal environment. Thanks so much for your posts and for the introduction to Jolee! I dream of living on the coast and listening to the pounding of the waves. new gfc follower & we moved to the beach about 6 months ago, loving it!! WHAT GREAT PILLOWS! ... love all of them but especially sea turtle, waves, and CRAB(Im a cancerian as well as lover of all things ocean). Palm Beach County Florida has one of the greatest coastlines in the USA...and Im working hard to keep it that way! I found your Facebook page through a FB friend. I love the sea and the islands and try to incorporate that into my life as much as possible. Being near the water is when I can really breathe. It's where I find my peace. I used to live closer to the coast but I am now about 5 hours away, but still love to visit! I'm a GFC follower :) I wish I was closer to the beach, but we still visit once a year...it's about 2.5 hours away. I follow via GFC and live near the beach, so we incorporate coastal shells and things into our lifestyle all the time. I'm a new follower..and I wish oh how I wish that I could tell you about my coastal life, it's really where I'd love to live, I've wanted to move there for my entire life! Unfortunately I cannot but these amazing pillows you are giving away are a good start, they are stunning! I would really enjoy a beautiful sea pillow to relax upon!